By the early 1980s it was clear that Kim Jong Il was to succeed his father, the "Great Leader" Kim Il Sung in leading the country. North Korea lost a strong ally with the fall of the Soviet block. Moreover, China's opening up policy led by Deng Xiao Ping in the early 1980s meant that the Asian giant adopted a financially stricter approach when dealing with North Korea, demanding more hard cash payment. China also opened up diplomatic relations with South Korea in 1992. These factors negatively affected the DPRK's economical situation which, added with unprecedented natural disasters in the 1990s and imposed economic sanctions, lead to what is now referred to the "Arduous March." The Leader Kim Il Sung passed away in 1994 and was named Eternal President. Three years of national mourning were announced and scenes of hundreds of thousands of North Koreans weeping the death of their Great Leader were broadcast. The "Dear Leader" Kim Jong Il became the head of state. The Arduous March period has now officially ended in the DPRK. 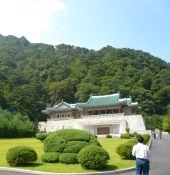 Please click on our Koryo Dynasty page to read about this period preceding the Choson Dynasty. Or see information about the incident that occurred in 1968 between the DPRK and the US known as the USS Pueblo Incident being an important part of international North Korean history.